The Bosch Evolution 800 B20CS80SNS Side by Side Refrigerator is one of the Top Rated Bosch Refrigerators. It is a 24" Counter Depth refrigerator like all Bosch Evolution refrigerators which are designed to blend in with standard cabinetry for a high-end look. This is a genuine "high performance" refrigerator. It has the Bosch Supercool™ and Superfreeze™ along with the Muti-Flow Shower Cooling System which gives this refrigerator some of the most consistant cooling power in this category. It's Energy Star® Qualified which means it runs efficiently and other features like External Controls and a Door Alarm will help keep your energy costs to a minimum. Learn more about the current Energy Star Rebates paid for by the US Government when you buy an Energy Star rated refrigerator. 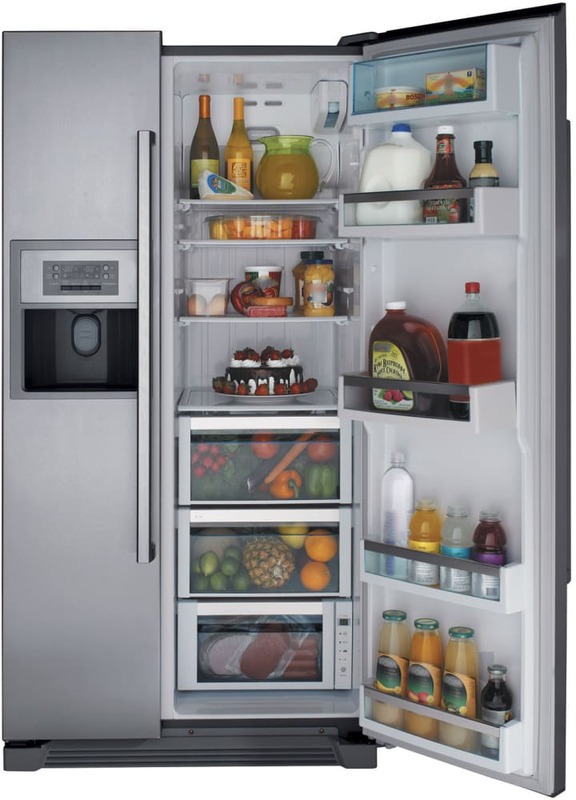 If you already know all you need to, then click here for more Energy Star Refrigerator Reviews. The Adjustable Tempered Glass Shelves give you use of most of this refrigerator's 20 cu. ft. capacity. And the Exterior Ice and Water Dispenser delivered high quality tasting water and ice. The ice maker seemed a bit slower than expected and the replacement refrigerator water filters are almost twice the average for similar brands. Also, realize that when you purchase a "counter depth" refrigerator you're going to be giving up a bit of storage space.